to place in the Great Room. Well that led to me thinking that it is time for a change. So off to the linen closet I went, to see what pillow covers I can use for the room. in various shades of pink and raspberry. Just what the room needed for a Spring Refresh. and love bringing them out to use in various rooms of the house. They seemed to be just what this room needed to welcome Spring. just waiting for me to come in and bring it home! to coordinate with the Chinoiserie pillows and vase. 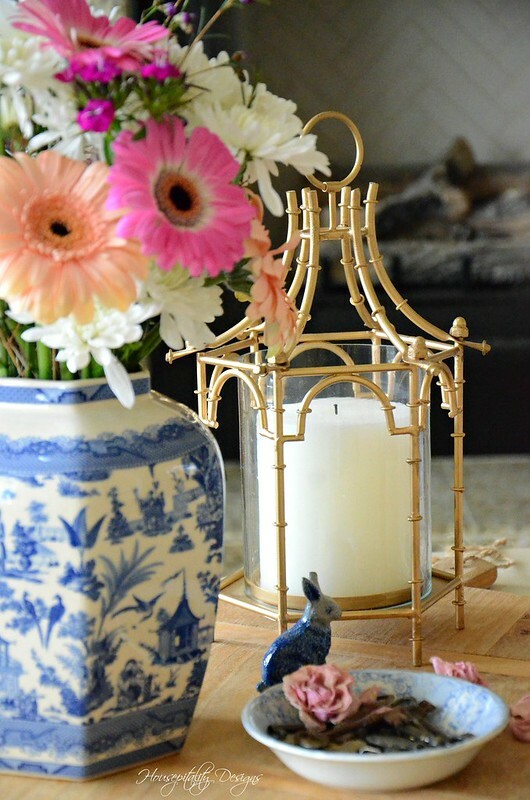 It cannot be a Spring vignette without a bunny! My azaleas are not blooming yet, so the next best thing was to buy one! The small Azalea plant was placed in my antique transferware chamber pot. by having these concrete garden finials that are a staple on my hearth. These are the pillows I chose to place on the sofa. The floral design is one that I have had for years! 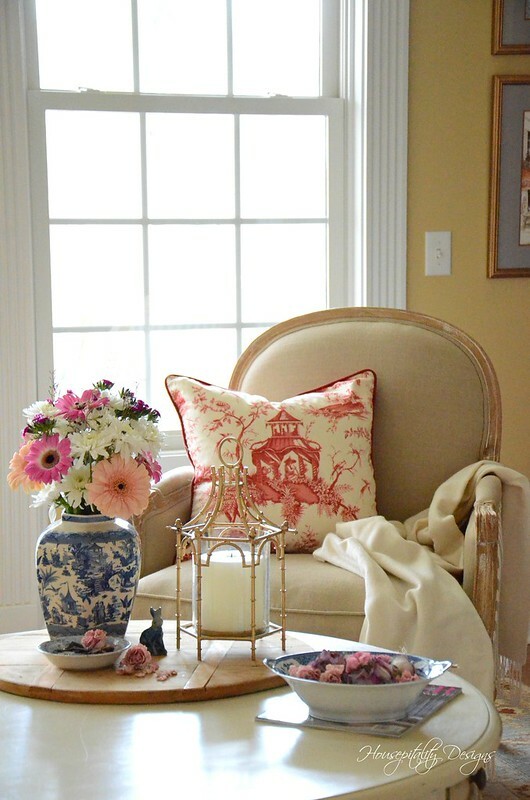 The Rose Pink pillow is a somewhat recent find in the clearance bin at Pottery Barn. 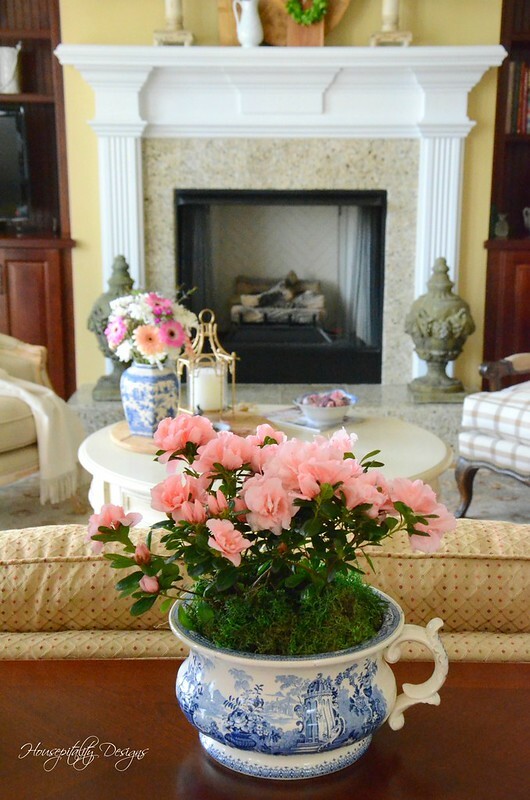 In less than an hour, the Great Room was refreshed with Spring Pinks! with the exception of the blue and white transferware vase. A great deal at $22.00 and it has a hallmark on the bottom that I need to research. but keeping my priorities in place and spending some time with my Sweetie. I wish you all a Very Happy and most Glorious Easter! You do find the best deals at that shop. That would have been much more expensive at the consignment shop here I use to shop at. She was quite pricey. Love the addition of the pinks and that cute teeny tiny bunny. I love the color in your home! The walls, the sofa, the pillows, the flowers. White has been the thing for so long that I’ve become bored with it. Don’t change a thing your home is beautiful! Alice, I agree with you about all whites becoming boring! Thanks for that comment, it has helped seal my decision about a new paint color for my downstairs!!!! PS, let me know what you find out about the vase. I also meant to say how much I have always loved those finials on your hearth too! 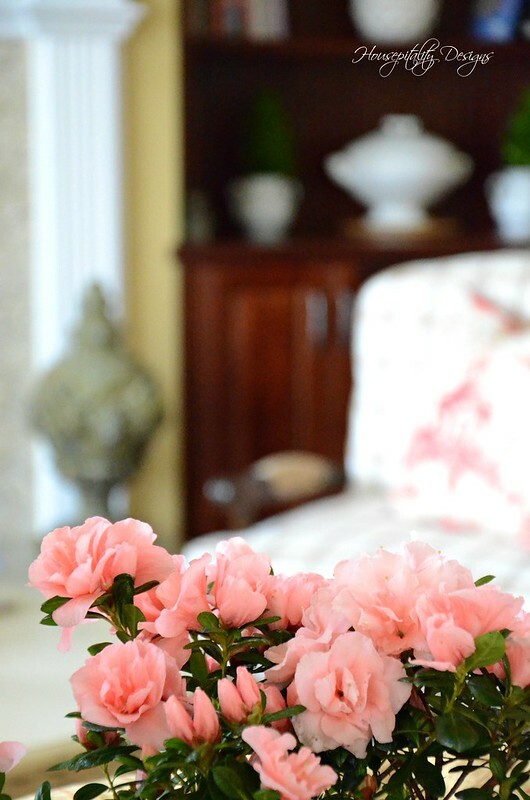 Hi Shirley, beautiful pinks in your great room! 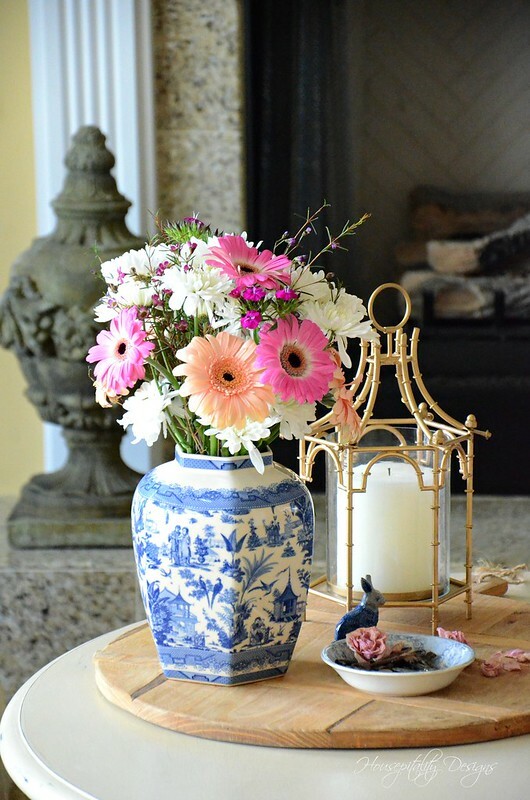 You do such a fine job of finding the right pieces, and creating the right vignettes, adding just the right amount of seasonal color and flair to your home! It’s certainly the mark of a great designer. I hope you’ll share this and all your seasonal posts at the Spring & Easter Joys link party I’m co-hosting this weekend. It’s open now through Monday, and will be a great place to find lots of inspiration all in one place. Happy Easter to you, my friend. Looks awesome! Love it! Pink is my favorite color, so you know I love it! 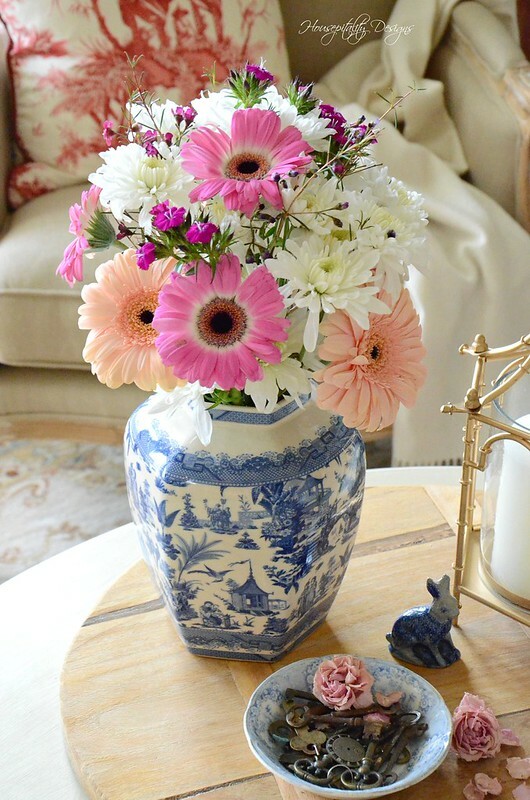 Great find in the gorgeous vase at a fantastic price. Nothing like a good deal! Great finds at Pottery Barn, too! Hope you have a wonderful Easter weekend! No matter what theme color you choose, it always blends together well with whatever you choose to put together! I love it! Beautiful new piece! Luck must be on your side every time you walk in that shop! You’re in the pink, Shirley! Happy Easter! Your room is so pretty! 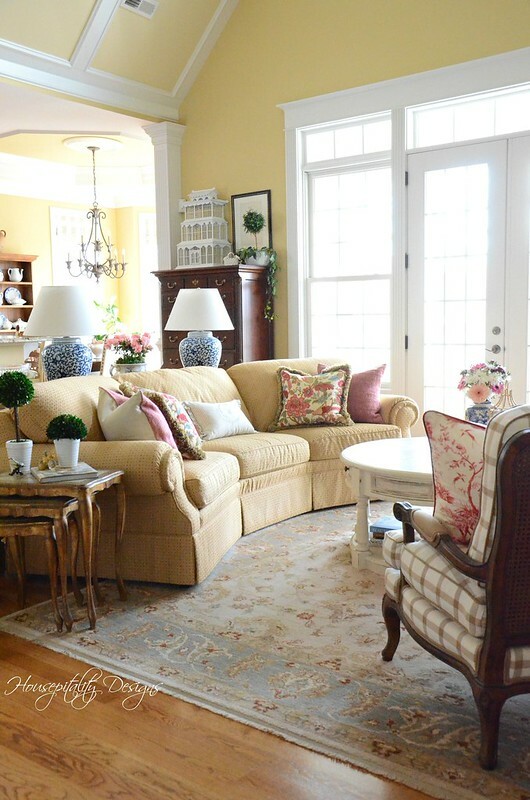 I love all the spring decor and the print on those pillows is perfect! Shirley, You have the decorating gift for sure. Your photos are very well done also. I love your chinoiserie pillows and candle. Your arrangements and styling is so striking. It’s amazing what a skilled and talented mind can put together in an hour! This is a fabulous transformation!!! That chinoiserie pillow reminds me of the Joe Nye book…can’t think of the name of it…but that man has a WAY with chinoiserie!!! Just a touch like you have applied here goes a long, long way in conveying a designer look that is beyond “pleasing to the eye.” I love it! Doesn’t hurt that pink is my favorite color, of course! Beautiful Shirley! I love all of your pillows. I so adore your use of pink and oriental accents!! 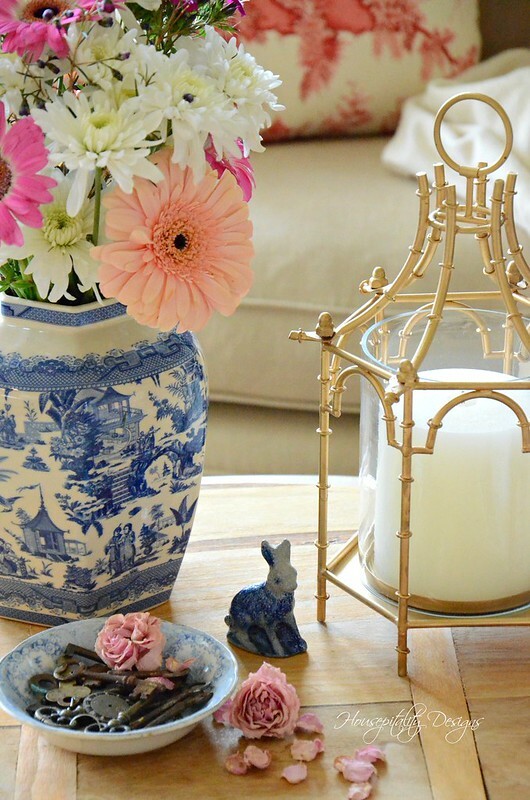 Where did you purchase that gorgeous gold pagoda candle holder? It is beautiful. This is a beautiful refresh for your room. Love the pinks. I hope you will let us know about the pagoda candle holder. Beautiful! I so love consignment stores. Shirley, Though shopping our homes is fun and satisfying (I often rediscover things I have “forgotten” about) there is nothing like the thrill of a great find at a thrift store or consignment shop! Everything looks lovely. Have a most blessed Easter!! Shirley, everything looks beautiful! It is always fun to shop your house and create a new look. 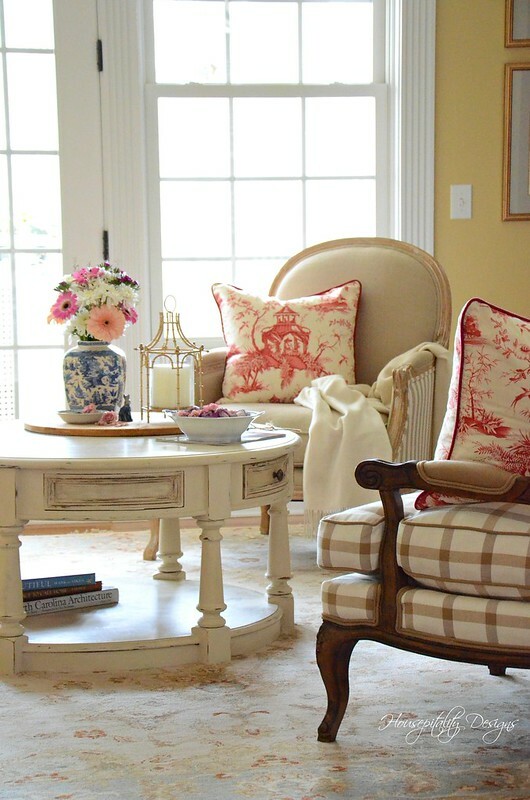 I love those chinoiserie pillows! They look so pretty in your greatroom. I hope you have a Happy Easter!!! Beautiful as always I had 2 chairs with the same fabric as your couch and loved them!! Shirley, you make everything look so effortless, but with a great eye for design! 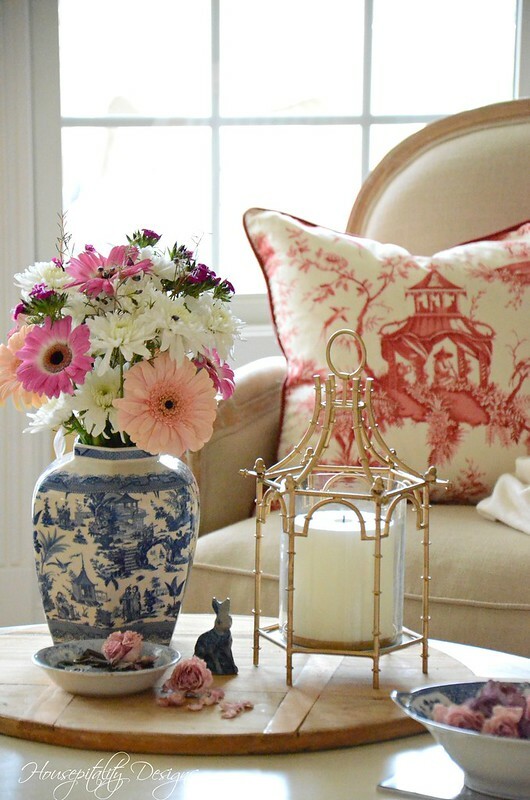 I love the refresh in the family room, the pinks are so pretty…I love the chinoiserie pillows! Wishing you a most blessed Easter! Pam Richardson’s recent post…What Is Your Friday Plan ? Shirley, those pillows from Pottery Barn were a great bargain! They are perfect for your Living Room. Love the little bunny, too! Happy Easter! 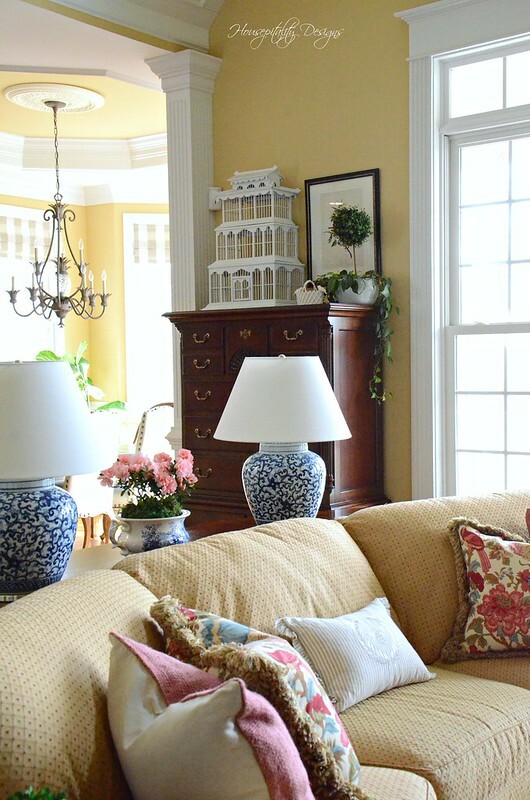 I love your touches of pink in the great room but I especially love the pagoda lantern! I know the history of that purchase and I am so happy that you bought it. Easter blessings to you and your family! 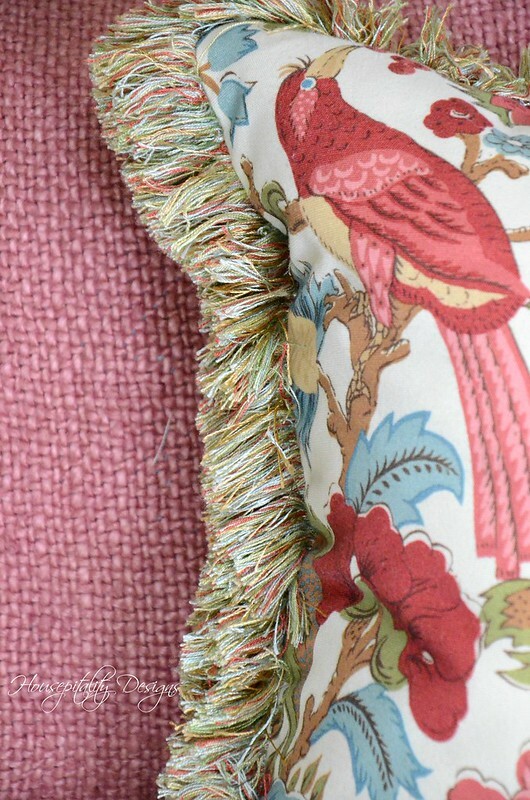 Your room looks lovely with the touches of pink/raspberry. The azalea, what a beautiful color! Have a blessed Easter! This comment is a bit late, but I agree with you about the bunny and spring. 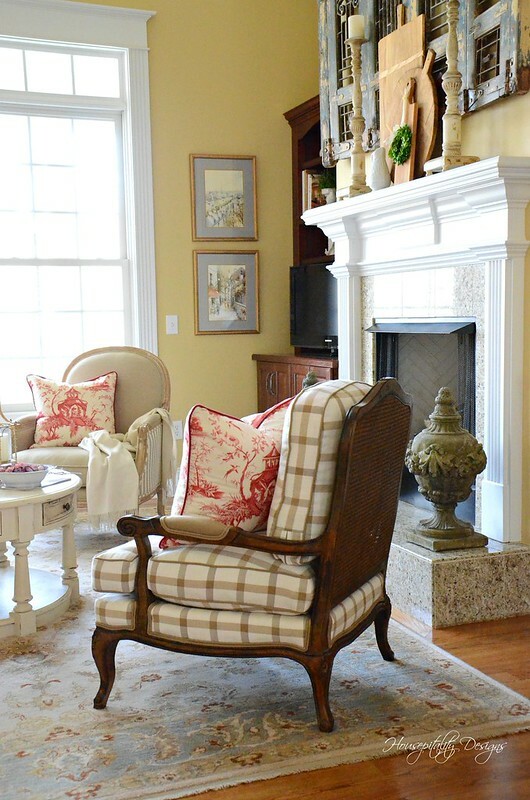 I saw a photo in Southern Living a few years ago of a hare sitting on a fireplace hearth in a Charleston home. Immediately fell in love with it and searched for more years before I finally found a similar on on the internet. Ordered him and he now has a place of honor on my hearth. I love him so much I leave him there year round. Your blogs and post on FB are so lovely. Thank you for sharing!